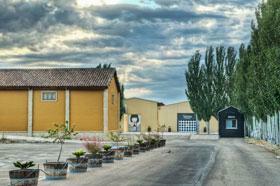 Bodegas Carchelo was founded in the early 1980s in one of the earliest efforts to bring Jumilla into the age of modern wine. In addition to the indigenous Monastrell (Mourvèdre) variety, Tempranillo, Cabernet Sauvignon and Syrah are grown to enhance structure. Achieving a fresh and balanced style, by the early 1990s Carchelo's rich young red hat put Jumilla on the road to international respectability. Located at altitudes between 2000 and 3500 feet in the transition between Spain's coastal plain and inland La Mancha, Jumilla's aridity combines to result in fresh nighttime temperatures during the hot growing season. Chalky and clay soils offer ideal footing for the red varieties. With less than eight inches of rain per year, grape health is seldom a problem. 700 acres of estate vineyards are planted to Monastrell (Mourvèdre, both ungrafted head-pruned and wire trained vineyards), Syrah, Tempranillo, Cabernet and Merlot, and are located in a wide variety of subregions, altitudes and exposures, reducing the risk of frequent hail damage in the area. Only half of the grapes produced by the estate are used, allowing for strict selection of grapes and subsequent wines. Production focus is the young red "C" (Carchelo), majority Monastrell aged two to three months in French Oak. Atico is a more concentrated and age-worthy wine from Syrah and Monastrell, aged four to six months in new oak. Canalizo, from organically farmed Syrah vineyards, is aged 12 months in new oak following malolactic fermentation in barrique. Winery Notes"A blend of 35% Monastrell, 30% Cabernet Sauvignon, 25% Tempranillo, 10% Syrah. A velvety and round palate is highlighted by red fruit and mineral notes with a long finish."